'The World Cut Out with Crooked Scissors' – the selected prose poems by Carsten René Nielsen was published October 2007 by > New Issues Poetry & Prose in the United States. 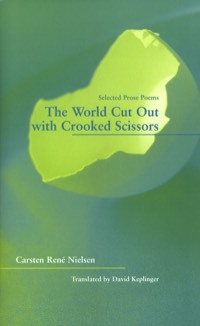 'The World Cut Out with Crooked Scissors' consists of translations of prose poems from Carsten René Nielsen’s books of poetry published 1998-2005: 'Circles' (1998), 'Clairobscur' (2001) and 'Forty-One Animals' (2005) translated by American poet David Keplinger. "Spider", "Lion" and "Albatross" are from 'Forty-One Animals' (2005), "Shadow" from 'Clairobscur' (2001), "Sleep" and "Autumn" from 'Circles' (1998).